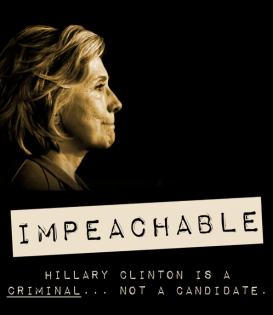 "Tell Congress: IMPEACH Hillary Clinton & Disqualify her from Holding Office"
Hillary Clinton must be impeached and disqualified from holding office in the United States. Congressional precedent dictates that all elected officials remain subject to disqualification from holding office by impeachment even after their terms have ended. It was John Quincy Adams who said, “Every officer impeachable by the laws of the country, is as liable, twenty years after his office has expired, as he is whilst he continues in office, and if such is not the case, if an officer could thus ward off the pains of impeachment, what would be the value of the provision[?]" • As State Secretary, Hillary Clinton abandoned the besieged in Benghazi on September 11, 2012, costing four Americans their lives: Ambassador Christopher J. Stevens, security officers Tyrone Woods and Glen Doherty (former Navy SEALs), and information officer Sean Smith. • As State Secretary, Hillary Clinton accepted, via the Clinton Foundation, emoluments from foreign national governments in direct violation of Article I, Section 9, Clause 8 of the Constitution which proscribes any U.S. official's ability to receive gifts from foreign powers without Congress' express consent. • As State Secretary, Hillary Clinton illegally harbored official emails on a private, non-official server in violation of the Freedom of Information Act and to the detriment of national security. Take action and petition your members of Congress – Demand that they impeach Hillary Clinton and disqualify her from enjoying "any Office of honor, Trust or Profit under the United States" per Article I, Section 3, Clause 7 of the Constitution. After the FBI's decision to shield Hillary from prosecution, Congressional action is our final option to keep lawbreaking Hillary out of office. Best idea in a while. Just do something!! Nobody seems to have the balls to go against her. She needs to be in jail!!! Glenis B. from Burbank, CA signed. This country and this world will go down in fire if Hillary were elected president. Please do what you can to bar her frim ever running for presidentvagain. Kelcie H. from Anchorage, AK signed. Hillary Clinton must not be able to hold any other office within the United States of America's Government. She needs to be tried for her serious crimes - NOW! She needs to finally face justice! Someone from Minden, LA signed. Someone from Waddell, AZ signed.